More and more people are remembering that nature is the source of beauty and are turning to genuine natural cosmetics. Instead of wearing our health down with controversial chemical ingredients, we can indulge our skin and hair in the long term using natural active ingredients that are highly effective. This is because the nourishment you give your body ultimately plays a crucial role in feeling good in your own skin. BIRKENSTOCK NATURAL SKIN CARE nourishes and protects your skin using the power of nature - to give you a beautiful, vital, even, pure, and youthfully fresh appearance. For the best results, you should adapt your daily skincare routine to your skin type. Even factors such as stress, intense sun exposure, and changing environmental influences must be taken into consideration. For example, during the winter, both the cold temperatures and dry air take their toll on our skin, which therefore requires more enrichment and nourishment than it does in summer. Our suggestions will help you to quickly and easily find your own personal combination of products. This daily skincare routine using our highly effective, certified natural cosmetic products will give you some short but intense me-time - so that you can relax and indulge yourself a little, all while invigorating your skin with lasting effects. Each step of this skincare routine is like a small rite just for you and your beauty. Enjoy it! An absolute must for healthy skin: facial cleansing. This is the first step in any daily skincare routine. It is essential as the following skincare products can only be fully effective on skin that has been thoroughly cleansed. During cleansing, fat-soluble and water-soluble dirt, as well as skin lipids, sebum, and skin flakes, which form on the skin overnight, are removed. The skin’s pH value is also regulated and stabilized. This is essential for keeping the skin’s natural barrier intact and protects it against increased loss of moisture. Use the Velvet Cleansing Milk for gentle cleansing in the morning. Squeeze a hazelnut-sized amount into the palms of your hands and apply the cleansing milk to the face. Gently massage the Velvet Cleansing Milk into the skin using your fingertips, working in circles outwards from the center of the face. Afterward, thoroughly rinse the product off with lukewarm water. For very sensitive skin, remove the cleansing milk with dry makeup wipes. Repeat the application on the neck and neckline. The product is only intended for external application. Avoid any contact with the eyes. An absolute must for healthy skin: Facial cleansing. This is the first step in any daily skincare routine. It is essential as the following skincare products can only be fully effective on skin that has been thoroughly cleansed. During cleansing, fat-soluble and water-soluble dirt, as well as skin lipids, sebum, and skin flakes, which form on the skin overnight, are removed. Facial cleansing that dries the skin out too much should, however, be avoided, as this cause the formation of lipids on the skin. Use the Fresh Cleansing Gel for thorough cleansing in the morning, without drying out the skin. Squeeze a hazelnut-sized amount into the palms of your hands, work the gel into a lather with some water, and apply it to the face. Gently massage the Velvet Cleansing Gel into the skin using your fingertips, working in circles outwards from the center of the face. Afterward, thoroughly rinse the product off with lukewarm water. Repeat the application on the neck and neckline. The product is only intended for external application. Avoid any contact with the eyes. After cleansing, we recommended using a toner to clarify and refresh the skin. The Fresh Cleansing Toner removes the residue of the cleanser, as well as hard residual water and in doing so, already imbues the skin with moisture. Use the Fresh Cleansing Toner on the face, neck, and neckline. Spray the toning lotion on a cotton pad and gently rub the product into the face, neck, and neckline. Pat in the rest of the lotion using your fingertips, working outwards from the center of the face. The Fresh Cleansing Toner helps prepare your skin for the skincare products to follow. The product is only intended for external application. Avoid all contact with the eyes. After cleansing, we then turn our attention to caring for the sensitive eye area. Because the thin skin around the eyes is particularly sensitive and rather low in moisture, it requires special care. For wrinkles caused by dehydration, dark circles, or swollen eyelids, a specific eye balm helps the eye area to appear more awake and fresher. Targeted nourishment of the eye area also has a preventive effect on skin aging. Apply a pea-sized amount of Moisturizing Eye Contour Balm underneath the eye area and eyebrows. For this, squeeze the balm onto the back of the hand, carefully applying it around the eyes using the ring finger, and pat it gently in, working outwards. Only a small amount of Moisturizing Eye Contour Balm is required as the product is very rich. Avoid any contact with the eyes. To finish your morning skincare ritual, apply the daily moisturizer like a gentle layer of protection on the skin. Predominantly young and normal skin, but also skin tending towards the mixed type, require specific yet light daily moisture. This is to protect and supply the skin with moisture without overloading it. The Intensive Moisturizing Fluid is perfect for gentle moisturization, which protects the skin throughout the day. After thorough cleansing, apply a pea- to hazelnut-sized amount of the Intensive Moisturizing Fluid onto the face, as well as an equally-sized amount to the neck and neckline. Squeeze the fluid onto the palms of your hands and spread it out, before applying it to the face. Gently massage the fluid into the skin using the index and middle fingers, working outward in small circles from the center of the face. Keep well away from the eye area. Repeat the application on the neck and neckline by working in the product outwards. 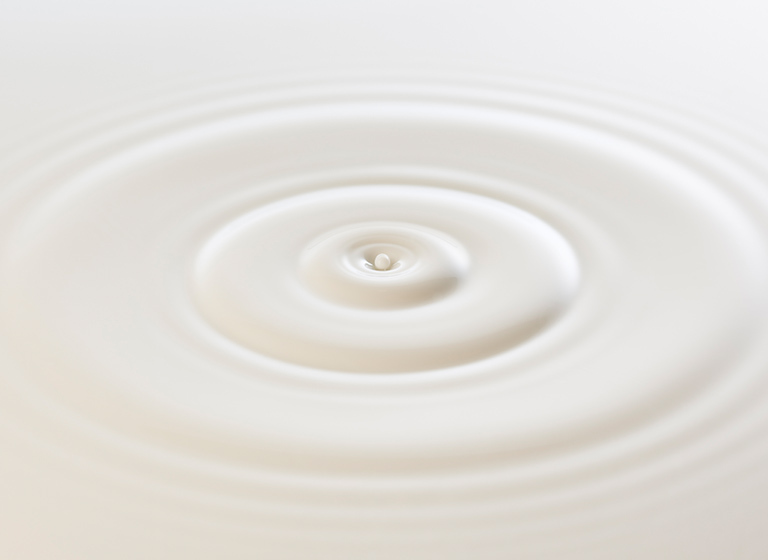 Only a small amount of Intensive Moisturizing Fluid is required, as the product is very rich. Afterward, apply your makeup as usual. To finish your morning skincare ritual, apply the daily moisturizer like a gentle layer of protection on the skin. To nourish and protect normal and dry skin throughout the day, we recommend using a moisturizing cream. This provides the skin with intense moisture, locks moisture in effectively, and offers protection against harmful environmental influences. In the morning after thorough cleansing, apply a pea- to hazelnut-sized amount of Intensive Moisturizing Cream to the face, as well as an equally-sized amount to the neck and neckline. Squeeze the cream onto the palms of your hands and spread it out, before applying it to the skin. Gently massage the cream into the face using your index and middle fingers, working in circles outwards from the center of the face. Keep well away from the eye area. Repeat the application on the neck and neckline by working in the product in outwards movements. To indulge and give your skin the nourishment it needs, apply the Intensive Moisturizing Cream in a slow and calming massage. Afterward, apply your makeup as usual. Only a small amount of Intensive Moisturizing Cream, as the product is very rich. An absolute must for the skin’s nighttime regeneration: facial cleansing. This is the first step in any evening skincare routine. It is essential as the following skincare products can only be fully effective on skin that has been thoroughly cleansed. Gentle cleansing rids the skin of makeup and grime, which build up throughout the day and places strain on the skin. The skin’s pH value is also regulated and stabilized. This is essential for keeping the natural skin barrier intact. Use the Velvet Cleansing Milk for gentle cleansing in the evening. Squeeze a hazelnut-sized amount of the cleansing milk into the palms of your hands and apply it to the face. Gently massage the Velvet Cleansing Milk into the skin using your fingertips, working in circles outwards from the center of the face. Afterward, thoroughly rinse the product off with lukewarm water. For very sensitive skin, remove the cleansing milk with dry makeup wipes. Repeat the application on the neck and neckline. The product is only intended for external application. Avoid any contact with the eyes. An absolute must for the skin’s nighttime regeneration: facial cleansing. This is the first step in any evening skincare routine. It is essential as the following skincare products can only be fully effective on skin that has been thoroughly cleansed. Gentle cleansing rids the skin of makeup, grime, sweat, and sebum, which build up throughout the day and place strain on the skin. Facial cleansing that dries out the skin too much should, however, be avoided at night, as this can lead to the formation of lipids on the skin. Use the Fresh Cleansing Gel for thorough cleansing in the evening without drying out the skin. Squeeze a hazelnut-sized amount of gel into the palms of your hands and work into a lather with some water, before applying it to the face. Gently massage the Velvet Cleansing Gel into the skin using your fingertips, working in circles outwards from the center of the face. Afterward, thoroughly rinse the product off with lukewarm water. Repeat the application on the neck and neckline. The product is only intended for external application. Avoid any contact with the eyes. After cleansing, we recommend using a toner to clarify and refresh the skin. The Fresh Cleansing Toner removes the residue of the cleanser, as well as hard residual water and in doing so, already imbues the skin with moisture. Use the Fresh Cleansing Toner on the face, neck, and neckline. In addition, spray the toning lotion onto a cotton pad and rub the product gently onto the face, neck, and neckline. Pat in the rest of the lotion using your fingertips, working outwards from the center of the face. The Fresh Cleansing Toner helps prepare your skin for the skincare products to follow. The product is only intended for external application. Avoid all contact with the eyes. After cleansing, we then turn our attention to caring for the sensitive eye area. Because the thin skin around the eyes is particularly sensitive and rather low in moisture, it requires special care. For wrinkles caused by dehydration, dark circles, or swollen eyelids, a specific eye balm helps to make the eye area appear visibly more awake and fresher the next morning. This is because while we sleep, our skin regenerates and during this phase, is able to absorb valuable nutrients. At the same time, targeted care of the eye area works effectively against skin aging. 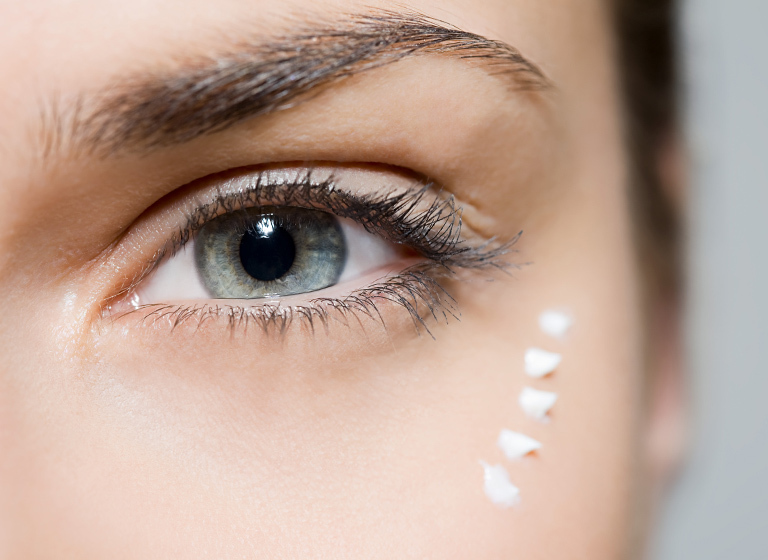 Apply a pea-sized amount of Moisturizing Eye Contour Balm underneath the eye area and eyebrows. For this, squeeze the balm onto the back of the hand, carefully apply it around the eyes using the ring finger, and pat it gently in, working outwards. Only a small amount of Moisturizing Eye Contour Balm is required as the product is very rich. Avoid any contact with the eyes. To finish the evening skincare routine, apply the Intensive Moisturizing Cream like a soft protective layer on the skin. For care and regeneration, the skin is supplied with targeted moisture overnight. This is because while we sleep, our skin regenerates and during this phase, is able to absorb valuable nutrients. Apply a pea- to hazelnut-sized amount of the Intensive Moisturizing Rich Cream onto the face, as well as an equally-sized amount to the neck and neckline. Squeeze the cream onto the palms of your hands and spread it out, before applying it to the face. Gently massage the cream into the face using your index and middle fingers, working in circles outwards from the center of the face. Keep well away from the eye area. Repeat the application on the neck and neckline by working in the product in outwards movements. To indulge yourself, relax, and provide your skin with targeted nourishment before going to sleep, apply the Intensive Moisturizing Rich Cream in a slow and calming massage and enjoy the moment as a gift to yourself. Only a low amount of Intensive Moisturizing Rich Cream is required, as the product is very generous.